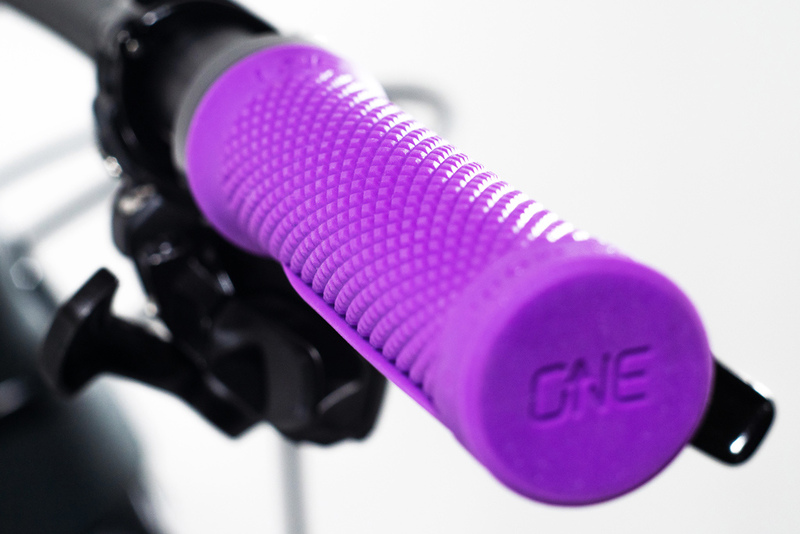 PRESS RELEASE: OneUp ComponentsOur goal for the new OneUp Bar, Stem and Grips was simple. It's the same for every product we've ever made. Design and engineer the components that we want on our bikes, for the riding we love here in Squamish and sell them for a fair price. We hope you like the new cockpit as much as we do. Read on for all the details. We wanted to make the best feeling bar possible, something that would let us ride harder for longer. The solution is our patent pending oval bar profile which combines the best ride characteristics of 31.8mm and 35mm diameter handlebar standards. This is the most comfortable bar that we’ve ever ridden, period. It's strong, lightweight, minimizes arm pump and vibration and maximizes steering response. 35mm done right. Almost every other carbon bar on the market copies the simple tapered profile of an aluminum bar. 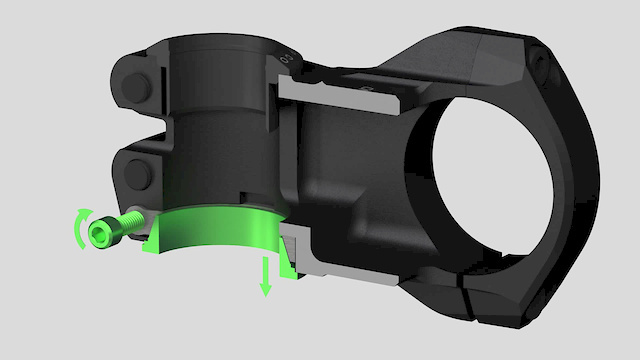 With carbon you can take advantage of more complex shapes to get a better performing product, so that's what we did. If you actually care about bar compliance, then you don't make a round 35mm diameter bar. Sure you can try to "optimize" the flex slightly with layup, but geometry is king and you're fighting a losing battle. The OneUp bar profile minimizes the length of the 35 diameter clamping area, as this is the stiffest portion of any 35 diameter bar. The 35mm clamp diameter quickly changes to a flattened, oval shape in the transition zone and then to a standard 22.2mm clamp diameter for the control zone.We benchmarked the OneUp bar against the most popular carbon bars on the market as well as foam filled aluminum bars. The results were, on average, a 21% increase in vertical compliance (comfort) coupled with a 28% increase in steering stiffness (responsiveness). These are more than just marginal gains.Until now the 35mm diameter standard has had a bad reputation and rightly so. This is 35 done right. Length: 35mm (157g) 50mm (173g) / 35mm Dia. / 0° Rise / Stem $85 USD Preloader Kit: $30 USDColour: Black. Top Caps available in Black, Red, Green, Blue, Orange, Purple & GoldThe OneUp EDC Stem allows you to store your EDC Tool in your steerer tube, without threading your fork. You can also adjust your headset preload without loosening your stem. There's a reason why so many EWS Pro Riders use the OneUp EDC Tool. In the event of mechanical, the EDC Tool is right at your fingertips with everything you need. We wanted to make the tool system available to even more riders, including those with previously incompatible forks and steel or carbon steerer tubes.The EDC Stem can be used with a regular star nut and top cap like every other stem. It’s also compatible with existing threaded EDC top caps, for people who’ve already threaded their steerer tube. Or you can use the new OneUp Preloader, which lets you store the EDC tool in your steerer without threading it. LOCK-ON GRIPS Colours: Black, Red, Green, Blue, Orange & Purple $25 USDA low profile single lock on, designed to reduce arm pump and hand numbness. The diamond knurled texture, with saw tooth finger ramps and a super tacky 20A compound provide ultimate traction. More traction means less death-gripping the bars and less arm pump. Our single lock has the profile of your favourite double lock-on. But to reduce hand numbness we've replaced the hard outer clamp with extra rubber for greater cushioning of your palm heel. Get all the benefits of an ergonomic grip without the city bike cruiser look! The Urge Archi-Enduro RR full face mountain bike helmet was designed by the most qualified enduro experts in the business.